The Democratic Union for Integration held Saturday its campaign within the presidential election in the Kicevo, where the head of municipal headquarters Urim Ahmeti said in his address said that voting for the consensual candidate will mean moving forward in the EU integration processes and membership in NATO and the EU, and thus the consensus as a concept of creating Albanian politics will win. 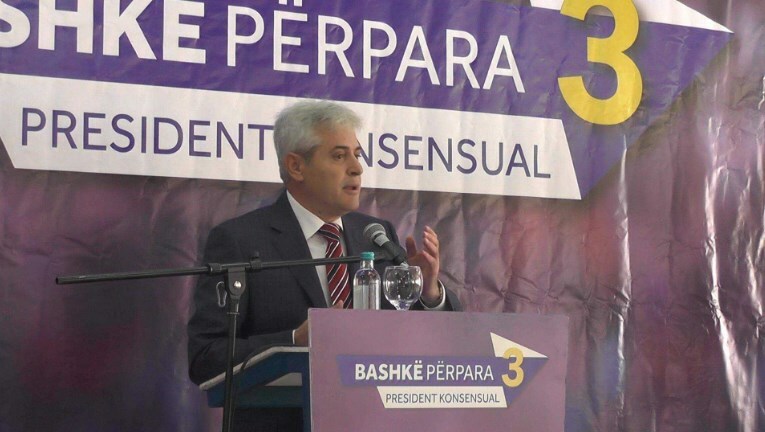 DUI leader Ali Ahmeti said before Kicevo citizens that the support for the joint consensual candidate is not only in favor of the Albanian citizens, but of all citizens, and above all, will benefit the state itself, because this country has a future with only good and a transparent future between the two parties that have legitimacy. If we want to live and work in this country, to install and work on these values because Europe is in front of our door, said Ahmeti, among other things. Economy Minister Kreshnik Bekteshi emphasized that they give priority to the new concept that DUI and Ahmeti installed, and based on this concept, the EU and NATO function too, he said. That is why we have accepted the idea of consensus and we support it, said Bekteshi. Deputy Prime Minister Bujar Osmani stressed that DUI is a modern political party that has successfully overcome several obstacles. We are convinced in this modern concept that we promote and that joint decision-making is basically a consensus between two large families, Osmani said. Kicevo mayor, Fatmir Dehari, also addressed the crowd, who focused on the counter response to Zijadin Sela, saying that they are not in political puberty and they will not lie to the people with impossible missions”.